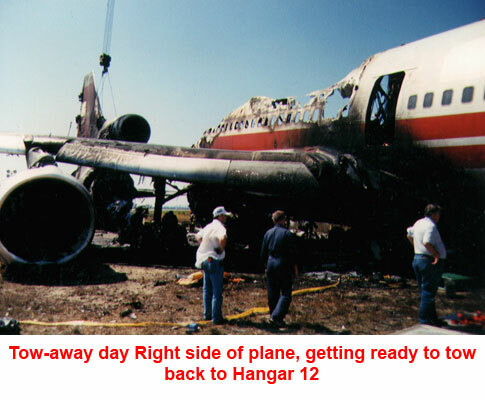 July 30, 1992 at 5:43pm TWA's Lockheed 1011, Flight 843, moved into position for departure. Flight 843, San Francisco bound, departing New York, JFK airport. Two minutes and thirty seconds later 292 people would fly into the journals of aviation history. 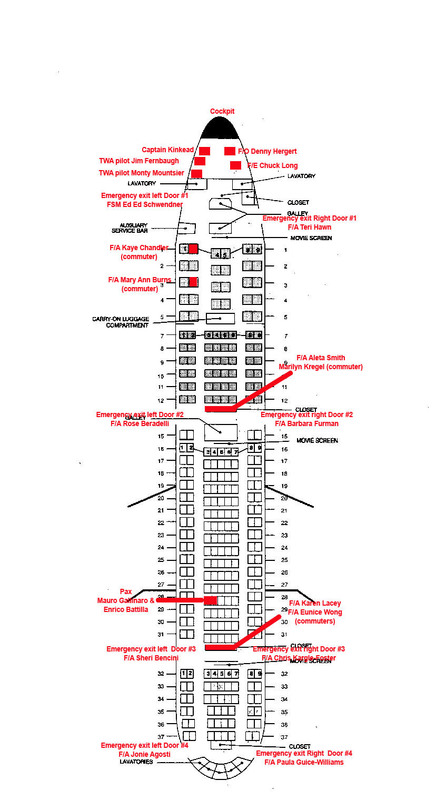 As Flight 843 rotated for takeoff, all seemed well. Filled to maximum capacity, 273 passengers, 3 pilots, 9 working Flight Attendants, plus 7 additional TWA crew members commuting home. Gross weight of this at take-off was 429,000 lbs, with 119,300 lbs of jet fuel filling the wings. This particular runway is is shown as 14,572 in length, the actual runway length normally used by an L1011 is 11,250. This is the normal 31L takeoff length. The exception for use of this runway was the Concorde, which was allowed to use all 14,000. The rest of the world uses 11,250, it's called an intersection TO. It was a picture perfect day - crisp blue sky and no wind. 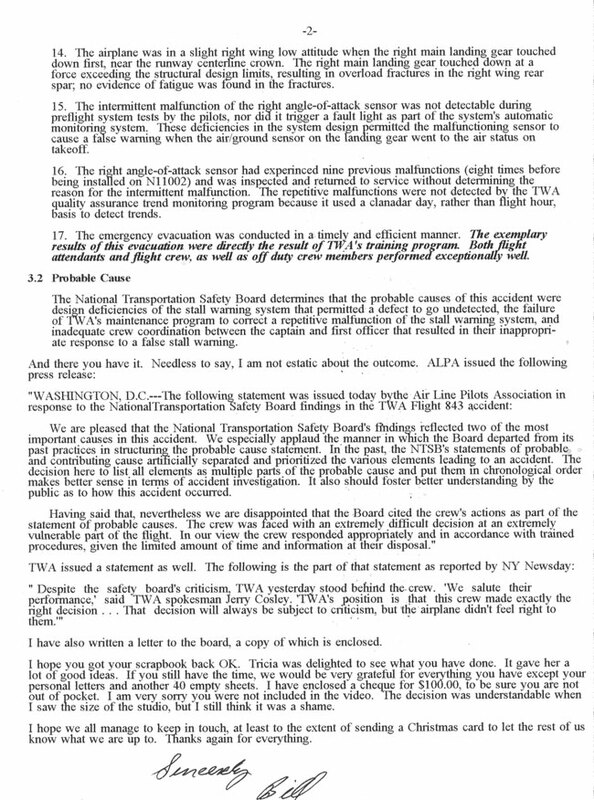 TWA taxi policy is to taxi with only the 2 wing engines (engines 1 & 3) operating. Not until takeoff ready is the #2, center engine, "fired up". At 5:43 the control tower approved Flight 843 for take off on runway 13-31. Flight 843 TAXIED INTO POSITION for take-off and the #2 engine was fired up. Flight 843 now accelerates down the second longest runway in the world. As the aircraft continues to accelerate, two separate but very serious problems developed. Number one was the right wing spar (fuel line to the #2 engine) had a crack, and jet fuel is now spraying all over the the belly of the plane. The main gears are heating up as the plane accelerates. The crack in the right wing spar is located directly over the right main gear. The heat from the gears ignites the jet fuel, within seconds the entire aft section of the fuselage is now a blaze. And the plane has yet to leave the ground. One passenger, who was seated in the tail section of the plane, was looking out the right window when suddenly her window was covered with an eerie orange glow - fire. She leaps from her window seat, into the aisle - and screams. And the planebegins to lift off the ground. The plane continues to accelerate, while the second, unrelated incident occurs in the cockpit. The stick shaker was vibrating on the control columns (the steering wheels of the plane). This is a stall warning system. The First Officer, who's leg it was to fly, could not determine if the plane would fly or stall - so he decided to turn the controls over to Captain William Kinkead. Captain Kinkead had a split second to make the decision of a lifetime - to fly or stay on the ground. Lift-off speed is 180knots. Just as the nose of the plane begins to lift off - Captain Kinkead decides to keep the plane on the ground. Later Captain Kinkead said that he is not sure why he decided to keep the plane on the ground. "Maybe years of experience, but something inside me said keep it on the ground". Captain Kinkead pushed the nose of the aircraft down - impact, loud explosions are heard as the plane barrels down the runway. Captain Kinkead activated the speed brakes, also known as spoilers, to slow the a/aircraft AND to provide more effective braking. He also used full reverse thrust trying to stop the speeding plane. The plane continues to race down the runway at 180 knots. Flight 843 was about 70,000 over its maximum landing weight of 358,000lbs. Somewhere in the midst of all of the activity the cockpit gets afire alarm warning signal from the #2 engine. The control tower tries to tell the pilots that there are flames shooting from the back of the aircraft. Flight 843 is really in trouble. "Runway 13R/31L can be used for intersection takeoffs and this is often the norm for everything but the Concorde, however the captain has the right to request the full length and most do with a heavy aircraft. I always did. The reason I aborted the takeoff is because when I tried to resume the rotation and applied much more than normal back pressure on the yoke, the aircraft would not respond. I was convinced it would not fly and we had a much better chance of staying alive on the ground, even though I knew there was no chance of stopping on the runway. Whether I consciously thought at that moment about the soft sand at JFK being a place to go, I cannot honestly say, but once I had aborted this was the obvious thing to do. According to the flight recorder data, just over one second passed between the time I took control of the aircraft and closed the throttles. Thus, I would estimate the actual decision time was less than one second. 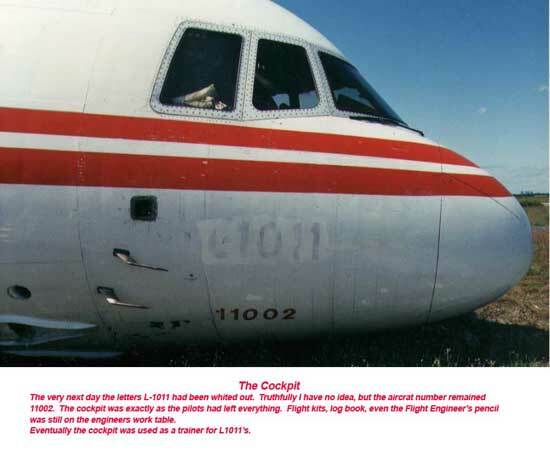 Lockheed stated there was an undocumented flight characteristic of the 1011 in that if the takeoff rotation was started and then back pressure released from the yoke, it could take as much as 10 times normal back pressure to resume the rotation. This was why I thought this was the most probable cause; however, a broken wing spar could distort the aerodynamics and cause the same thing. I did not realise that some of the FA’s had actually seen flames while the aircraft was in the air. The procedure for making an emergency stop is to activate the spoilers, apply full braking and full reverse thrust. This was done. Although it sounds more dramatic and must have felt that way to everyone in the back, the aircraft was never out of control. Had it been, it would not have been possible to keep it on the runway. At high speeds in order to maintain control of the aircraft you apply differential braking as well as rudder to keep the aircraft in the direction you want to go. The brakes are not like a car but are completely independent and are controlled by separate pedals. In order to apply full braking, you actually are straining against the back of the seat in order to apply maximum pressure with your legs. It would not be possible to strain forward and do this. You press on the brakes as hard as you can because the anti skid system keeps you from locking the brakes and blowing tyres. Newer cars now have this system. Once the nose wheel is solidly on the ground the rudder pedals (which are also the brake pedals – press on the bottom of the pedal for rudder and top for brake) allow you to turn the nose wheel but only up to about 8 degrees. We were slowed to about 80 knots (approx 93mph) when we turned off the runway and this turn, which was about 45 degrees required the use of the nose wheel steering. This is a little hand steering wheel located on the left side of the aircraft just to the left of the captain’s instrument panel. It was not difficult in a technical or physical sense to do this. At 80 knots there is no problem controlling the aircraft with nose wheel steering. When the nose gear hit the soft sand, it sunk several feet and this stress caused it to shear off." TWA Flight 843 has finally come to rest - permanently. 5:45 - passengers and crew are standing in the field watching as TWA's Flight 843 burns to the ground. When the fire department arrived - it would take at least 45 minutes to get the fire under control. Passengers and crew evacuated the aircraft in approximately 1 minute 30 seconds, with only 3 slides operative. 272 passengers, 19 crew members survived.